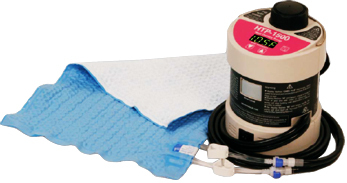 The HTP-1500 is a localized heat therapy system. It uses a flexible water circulating pad to deliver controlled temperature therapy to any area of the body. Unlike electric heating pads, the HTP-1500 is FDA approved for continuous use and can be used even while the patient is asleep. It’s also Medicare approved for use at home (E0217). There are no side effects to continuous-low-level-heat-therapy. Patients should however check skin condition frequently, especially if they have no feeling in the treatment area. The pump is microprocessor controlled and has built in safety features to prevent over-heating. The HTP-1500 is pre-set to a safe and effective temperature of 105 F, but can be adjusted if needed. The HTP-1500 works by dilating blood vessels and relaxing muscle tissue. When that happens more blood and oxygen are delivered to the treatment area. The improved circulation provides natural pain relief that also promotes healing. 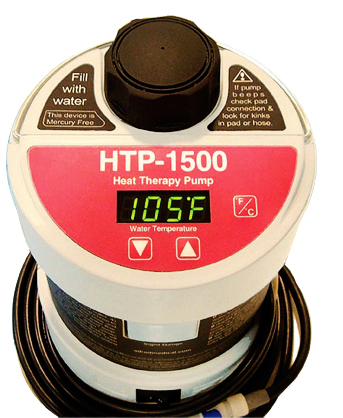 The HTP-1500 uses TAP WATER to deliver accurately controlled temperature therapy where it hurts, or where circulation needs a boost. The HTP-1500 pad can be folded, wrapped, rolled, sat on, slept on, and applied anywhere to the body!